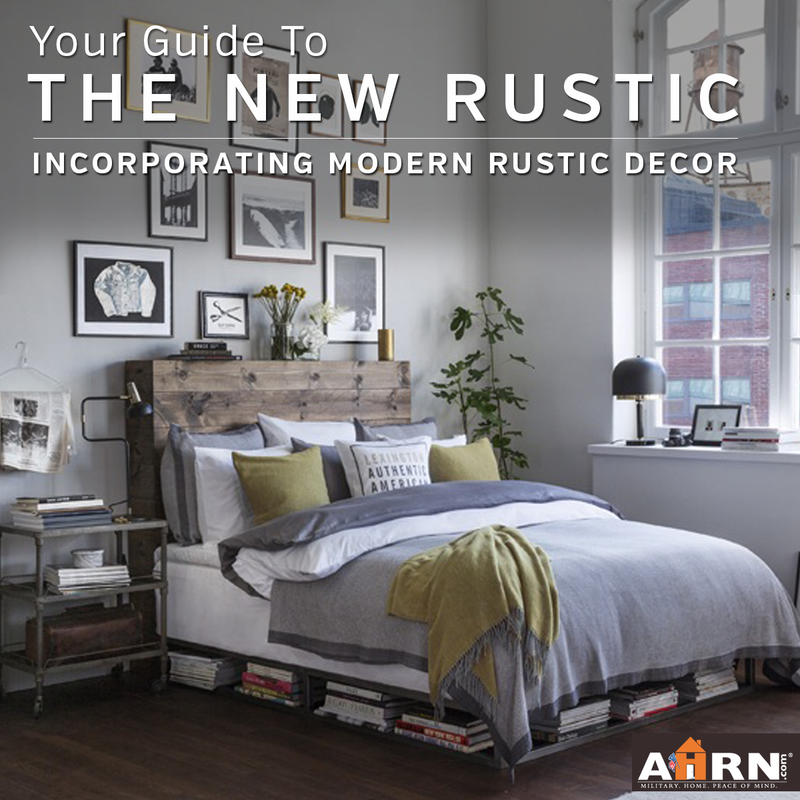 If everything old is new again, it’s one reason that rustic décor is THE rising trend in interior design. It’s a great look that appeals to just about all tastes, which can be completely blended with your individual style preferences – including clean and modern. And the best news? It doesn’t break the bank. In fact, a lot that can be done with found items or DIY! What makes something Rustic? AHRN.com has got your ultimate guide. More and more we are looking to re-purpose materials and narrow our footprint, being eco-friendly wherever possible. Rustic décor accomplishes that. It’s at once comfortable, current, affordable, and appealing to almost all tastes. And since there is no need for matching items, it makes it fun to put found and made items together with things you’ve bought or inherited along the way. And any fabrics or textures or accent colors seem to go with it – from shabby chic to chintz to leather. So you can really have fun making it your own. Blending items that might not normally go together like cowboy boots as vases with dried flowers next to an antique fisherman’s lamp. Making the most of any rustic elements in a room, like wide wood floors, supporting posts or wooden ceiling beams. Bringing the outdoors in mixing elements like stone, wood and leather and ceramics with man made fibers, glass, metals and plastics. Take a quick assessment of your place, then pick a room that seems a good place to start – a bedroom, the dining area. To illustrate, let’s use the living room. 2. Then adjust your focus to what frames the room: walls, floor, ceiling, window and lighting. 3. Lastly, note your accessories –pictures, art, rugs, throws, pillows, candles, lamps, vases, garland etc. What must stay, what can be redone, what could be removed? (Sometimes it can help to take them all out of the room to get a new vision). Time to apply the above. There are two ways you can go: keep the major pieces and add or change accessories – or change one central piece (like the living room coffee table) and just tweak the accessories to carry that theme. If you can’t afford to replace a major piece, can you recover it? Put a table cloth over it? 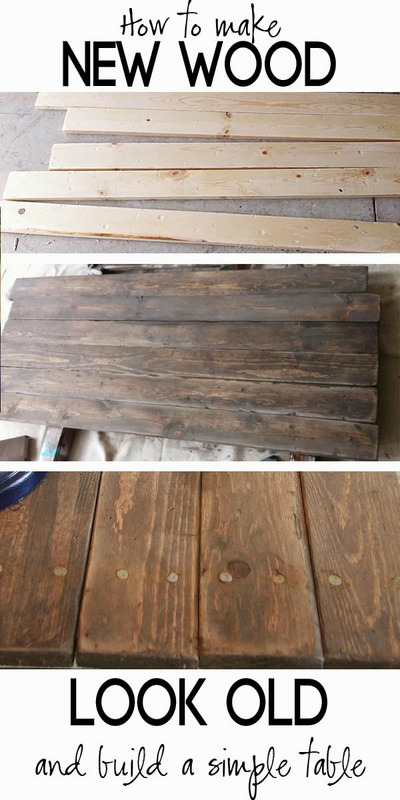 Or maybe you can get some materials and make it look old… For example, you could make a rustic cocktail table yourself. Paperdaisydesign.com shows you how on their blog. You can paint the whole thing, or just do an accent wall. You may decide to add wooden beams to the ceiling (if you own) or uncover them if they exist. 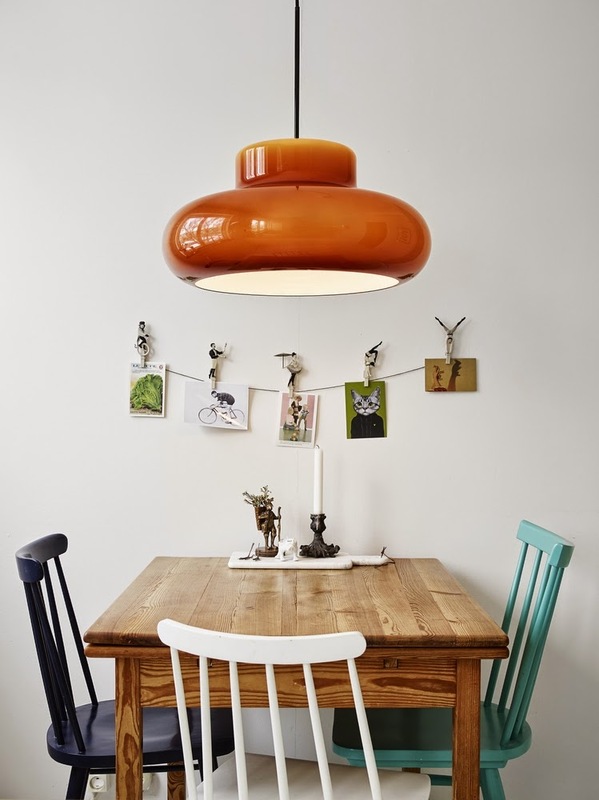 Do you add a lighting element made from antlers, wooden branches, rusted metal or galvanized piping? 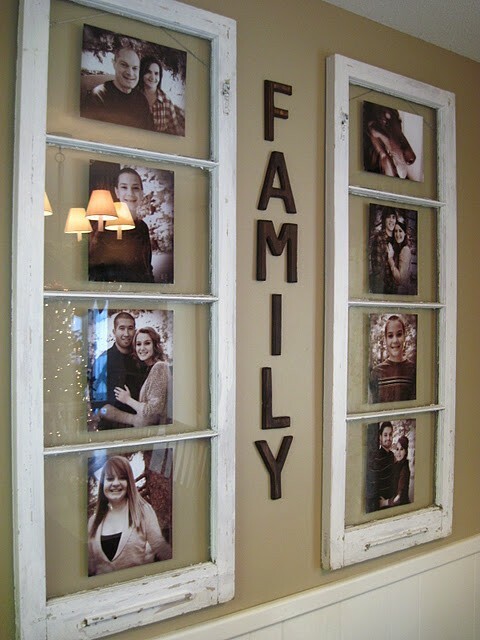 And you can put simple things on a plain wall that will wow like this family photo wall done with 2 abandoned windows and wood letters, which you can learn how to make on from a blog post on Cottage Instincts. In your office or kitchen, paint thrift store chairs, each a different color, use clothespins or wire to pin postcards or photos to twine, add another color and texture with a modern glass lamp. Even small changes can transform the mood entirely. 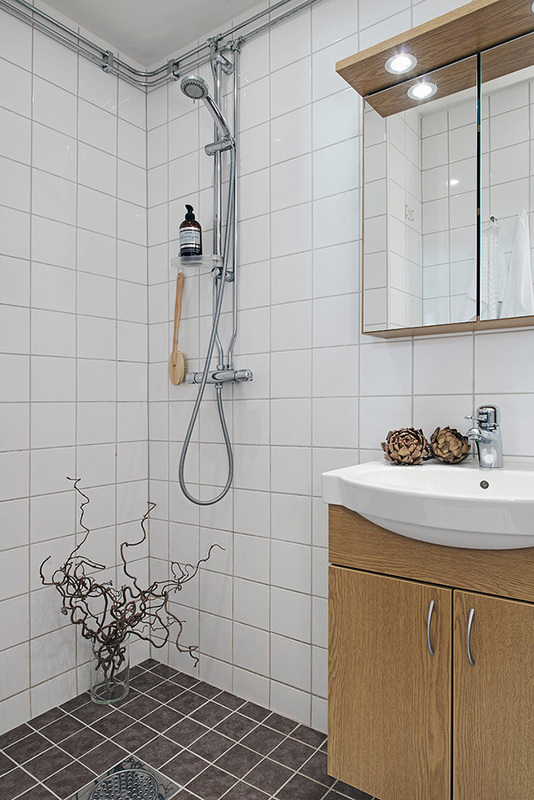 Take a look at how just the two wooden artichokes, the glass vase with a few branches and a common wooden body brush completely warms up this very modern, sleek bathroom! Add a textured towel or bathmat (even in a color like teal or navy or rose) and it would warm it up even more. This is the fun part: Utilize books, pillows, throws, wall hangings, art, antique metal signs, plants, ball jars and think out of the box for their use. 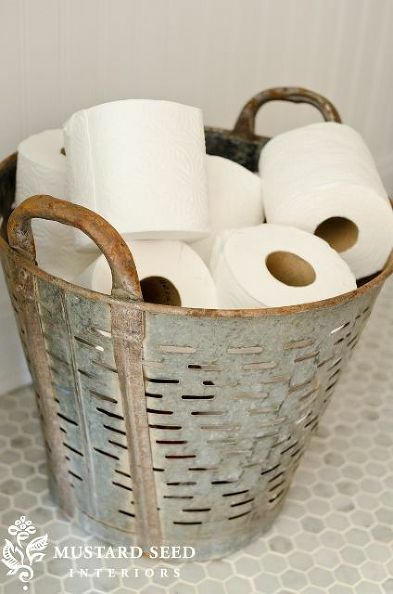 Galvanized buckets can serve as purposes as your imagination can conjur up! Collect them in different sizes and shapes. 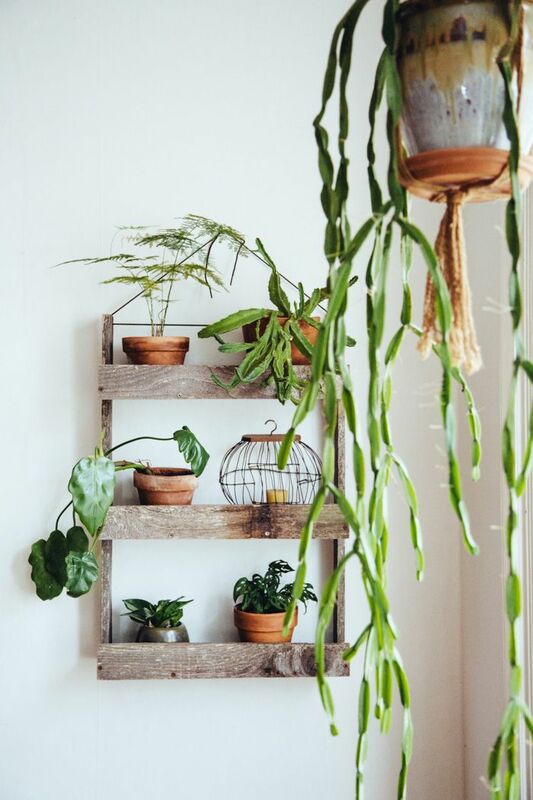 If they come with rope or leather straps, all the better to add another rustic element to the mix. 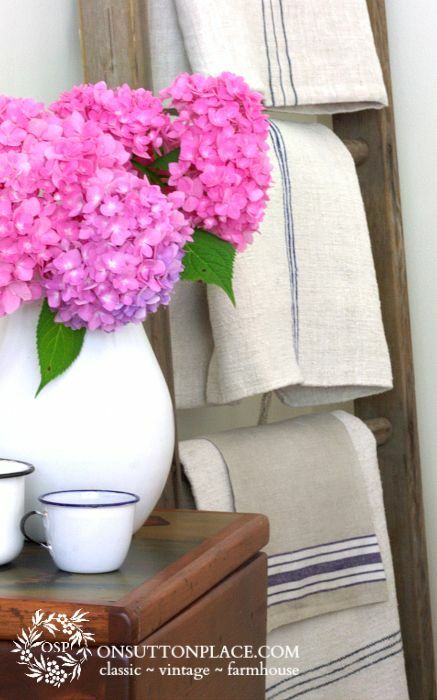 Wooden ladders can be a place to hang magazines, dishtowels or bath/bed linens. The more beat up the better – or you can get a new one and paint it, stain it, sand it down in places, or dent it here and there to create the look you’re after. You can find 40 DIY rustic décor ideas on DIYandCrafts.com. Here’s a great example of how everything above combines when applied to a whole room. The main eye-catching piece is rustic – a rough wooden headboard, which warms everything else up. Your frame: sweatshirt gray walls, dark wood floors, a wall of windows, high ceiling. Accessories make it homey and interesting: books stored underneath, black and white photos above, a re-purposed hanger on a hook to hold the Sunday news. The bedding in natural cotton and angora continue those tones in varying textures to compliment the photos and the matte finish metal medical night table. Adding interest, a pop of avocado green. That’s picked up by a dark green corner plant, which brings nature inside, along with the dried yellow and white flowers top the headboard. Natural light spills in by day and for evening ambiance, there’s a rust colored candle, a black lamp on the sill plus a bedside clip-on version picking up the touch of gold in the frames. So – whether you have a trendy city pad, an old farmhouse, or a temporary apartment Rustic Chic can work! Don’t despair if you are in what you feel is a nondescript rental unit with those famous eggshell walls and funky linoleum or carpeted floors. Those neutrals can be most easily transformed by rustic décor! Your place will look warm, inviting, stylish and rich all at once – so peruse Pinterest and the internet, and create your own personal take on it in the place you call home. 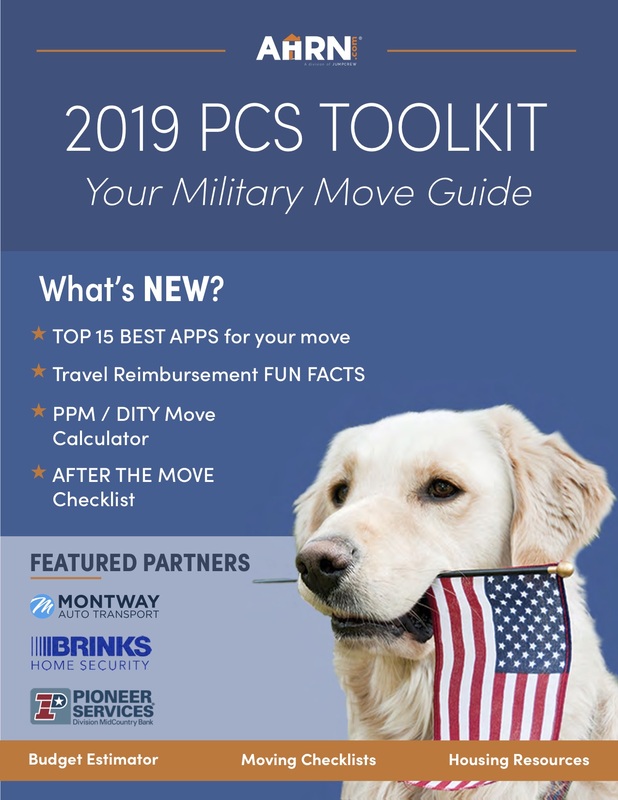 Want more tips and tools for making your house a home? Check out our Decor + Organization library! Wow I love these ideas and photos. Very inspiring. Love the suggestion for using a pop of color like the colored chairs around natural-looking table. Love that. 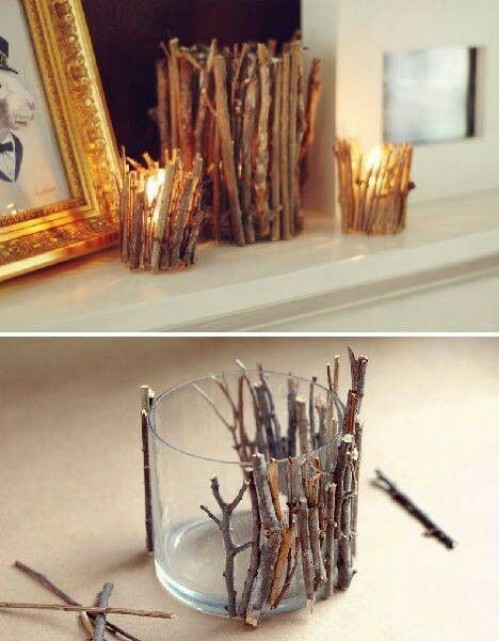 And I love the idea of bringing nature inside the home, such as branches and twigs. And so easy to do. So many great ideas here–would be a great book! Hi thrre Kristen, nice guide there. Rustic designs are one of my favs and although I haven’t adopted the style into my bedroom which we love it modern, our kitchen is one rustic haven. From the ceiling which is made of rustic plunk woods, to the walls and floors which is all wooden. I really enjoyed reading through your post and that bed almost changed my mind, thinking of doing something like that in our holiday home. Thanks a lot for sharing. Thank you Cindy! I’m glad you enjoyed it.